All Windows Open and other stories brings with it a piece of Australian fiction that tantalizes and speaks of women, the world, their dreams and their desires. 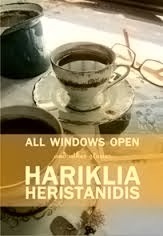 Hariklia Heristanidis takes the reader on the separate journey within each story but on a heartfelt road of intrigue within the book as a whole. So this is life and love from a Greek woman’s point of view. I am not usually a short story person, preferring to sink my mind into a journey with length, but I have to say I thoroughly enjoyed my 8 short trips within All Windows Open. Hariklia provides character of culture and wisdom that grab at your heart and mind, provoking thought and providing a place to get lost within another world. I did not feel a need to read All Windows Open and other stories from front to back in one sitting but instead needed to allow my mind to absorb and enjoy each story for what it offered. As a day or two passed between each reading I continued to live the journey Hariklia provided, enveloping myself in the enjoyment of the read. It is easy to see why All Windows Open was shortlisted in the NSW Premiers Literary Awards 2013. Here we have a book that embraces and celebrates the multiculturalism within Australia whilst also celebrating what is means to be a woman of today. I laughed, gasped and got lost within each story as it unfolded. This is more than a book, it is a neighbourhood of woman who embrace the joy and romance within life. One of the great things about this book is the lightheartedness feel that provides an engaging easy read. The cover, in the first instance, has one wondering what the book is all about. I would have liked to have seen a little more of an informative back blurb as I did feel a little confused as to whether I was about to embark on a journey of short stories that only related to Chrissie Triantafillou, your average Greek girl growing up in Melbourne in the 1980s, or taken on a journey of individuality. What I found within the book was not what I was expecting when I first picked the book up but I was in no way disappointed.